Professional LED Light Meter: Whether you're a photographer, a set designer, or looking to set the mood, proper lighting is a must. 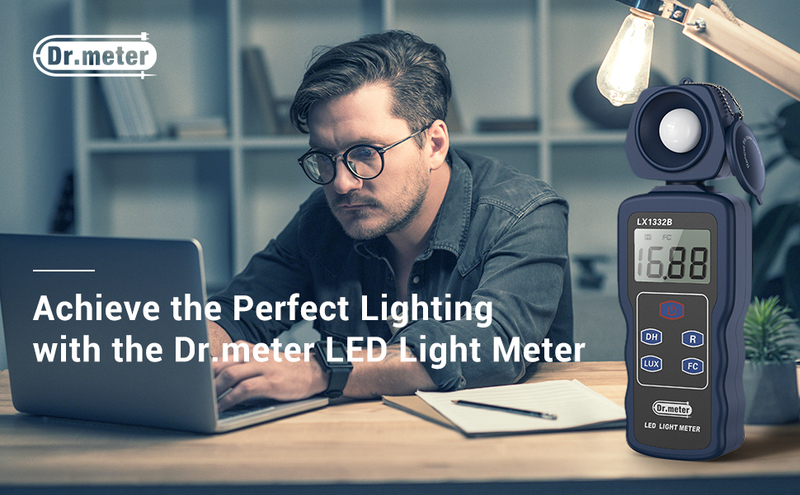 The Dr.meter Digital LED Light Meter measures the brightness (up to 200,000 lux) of fluorescent, metal halide, incandescent, and high-pressure sodium lights, guaranteeing the perfect luminosity every time. Ultra Fast, Ultra Precise: A split second is all it takes for an accurate reading. An advanced built-in calibration sensor measures the light levels at a super fast, twice per second speed. Easy and Intuitive: Using this digital LED light meter couldn¡¯t be easier. Just turn it on, point it at the light source, and check out the reading on the display screen. There are 4 adjustable measuring ranges (200lux, 2,000lux, 20,000lux, 200,000lux). Preprogrammed settings like auto power off, data hold, unit adjustment, and more do the hard work for you. 270 Degree Rotatable Detector: Keep an eye on the light level anywhere in the room. The optical detector rotates a full 270 degree for muti-directional detection. Tripod Mountable: Have your hands full? Don't sweat it. Thanks to the screw base design, this photography light meter can be placed on a tripod for hands-free use.